There are very few people that don’t appreciate the value of a meal at McDonald’s. Not only is it a great trip out for the whole family, with food and (if you’re lucky) a soft-play area and iPads that the kids can spill milkshake on, you can feed all of those hungry mouths for less than you’ve spend on one standard plate at most other restaurants – if you’re thrifty. The cheap, cheerful food is already a godsend in many ways (as a treat, of course) but there are some secret hacks which make will make visits to Maccy’s even more affordable and delicious. Most McDonald’s fans love a good McDonald’s breakfast. And while the McMuffins are life(! ), the restaurant’s iconic hash brown has to be what makes the brekkie. No matter where you go or how much you try you can never find a hash brown quite like it. The downside is, as soon as it hits 10.30am those potato goodies get stored away and the burger menu makes it way onto boards, leaving the two in their own distinct worlds – so close but so far. However, one keen fan figured out a way to merge the iconic potato side with a classic cheeseburger to make the ultimate foodie treat – and it all hinges on that 10.30 swapover. Get there as soon as the clock strikes and you can order your cheeseburger to include crispy hash browns. The dream! So it turns out there’s a savvy way to get the iconic (and pricey) burger for half price. But warning – it does take a lot of work. All you have to do is head over to one of the restaurant’s self-serve kiosks and order a Double Cheeseburger. Then when comes to extra toppings add on: onions, mustard, pickles, lettuce and mayonnaise (i.e. all the glorious fillings of a tasty Big Mac). The only two missing ingredients would be the third bun layer (which makes it too bulky anyway) and (weep!) the legendary Big Mac sauce. However, some customers say the staff will add it onto your creation if you ask for it. It might be a bit of work but you’ll get the burger for only £1.59 instead of £3.19 – win! So apparently the perforated edges on the side of our fries box are actually there for a reason, as they can be folded down to make a diving board-like contraption for our ketchup!! Imagine all the trouble this is going to save on car journeys with your kids – just pass the fries back with the ketchup on the flap to avoid spillage. Our kids have eaten hundreds of them, so why have we only just found out about this handy hack that turns McDonalds Happy Meal boxes into mini trays? This trick makes it much easier for little hands to grab their carrot sticks (okay, fries, but we try), leading to far less mess throughout the meal. There’s even a little perforated seam around the bottom of each box to make whipping the top half away a doddle – consider our minds well and truly blown. Apparently requesting a receipt might get be the difference between getting a juicy fresh burger or one that’s been sitting around for hours. McDonald’s worker Kamran Adam revealed the interesting trick on internet forum Quora, and explained that staff are more likely to give you a fresh burger if you request a receipt because they might think you’re a mystery shopper – someone who goes to different establishments to rate the service and food. Mystery shoppers have to request receipts for reimbursement purposes, so Kamran says requesting one might make staff work harder to make sure you have a pleasant experience. We all know the struggle of trying to even out the ice-cream-to-topping ratio on a McFlurry, but with quite so much of the latter it’s never going to make it all the way to the bottom. So Flurry fans will be over the moon to learn you can have extra toppings, and it’s as easy as asking for it! Apparently, you can have unlimited squirts of sauces or spoonfuls of chocolate pieces, for just 20p extra. Like most chains, McDonald’s is subject to reviews by secret shoppers. Between 12 and 2, and 5 and 7, is known is Gapbuster Time. Visit during these hours and ask for a receipt with your order, and your server will think you’re a bona fide ‘gapbuster’ – and you’ll get the best service £3.49 can buy. Can’t decide between a chocolate, strawberry or vanilla shake? You can ask for a Neapolitan, which is a combination of all three. Mmmmm, lovin’ it. Got a kid whose picky with their Happy Meal? Of course you do. 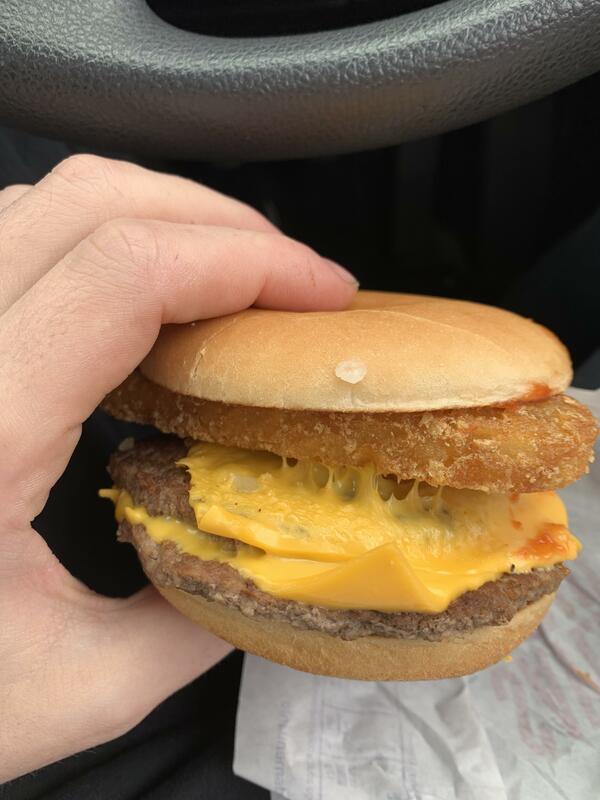 If you can’t tempt them with nuggets or a regular burger, you can order just the cheese between two brioche buns. A little uninspired, perhaps, but who are we to argue with a picky toddler? There’s no trick to fast food – it’s quick because it’s been pre-prepared, wrapped up and kept warm on a heated grill for a while. If you want your burgers freshly made, simply ask for it with an item added or removed. They’ll have to prepare it from scratch, which means it’ll taste fresher and more delicious. Same goes for chips – ask for yours unsalted, so they have to cook up a fresh batch just for you. This stuff is quite literally the stuff that legends are made of – maybe not one for enjoying in public with your family, but more one for furtive scoffing in your car at the drive-through. The Land, Sea and Air burger is a monstrous combination of a regular beef patty, McChicken and the Filet-O-Fish sandwiched together, complete with buns in between. If you’re not a fan of the slightly odd sheet-like eggs that come in breakfast wraps and bagels, you can ask for yours with the coveted ’round egg’ – the circular shaped egg patty normally reserved for English muffins. Likewise, if the regular seeded buns on Big Macs, McChicken and cheeseburgers are a little too stodgy for your little ones’ (or your) delicate palette, then you can ask for the steamed bun that normally comes with a Fish-O-Filet. Problem solved!